The Lyric SUP paddle is designed with the petite paddle boarder in mind. The Lyric has a smaller blade, shorter shaft lengths, and weighs less than most standard SUP paddles. A carbon shaft is lightweight and strong, giving each stroke a slight amount of flex for very comfortable performance. The Lyric’s blade is made of epX engineered polymer, a proprietary technology from Aqua-Bound, which produces enhanced blade stiffness and strength, while providing a smooth pull through the water. The aggressive dihedral shape of the blade down its spine makes for a forgiving and smooth forward stroke without any flutter. 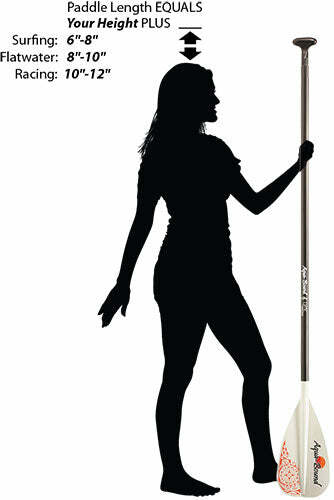 The blade’s size makes the Lyric ideal for women and smaller paddlers or for paddlers who use a high-cadence stroke. Blade Size 14.5" x 7.5"
Paddle Size 64-74" 70-80" 76-86"
Blade Portion Length 19" 19" 19"
Female Shaft Portion Length 18.5" 21" 23"
Male Shaft Portion Length 28.56" 32.06" 36.06"
Grip Portion Length 19.25" 19.25" 19.25"